2.00 cm long not counting the integrated ear hook . Amethyst faceted. Dormeuze model. Material is silver with an electroplated gold layer. 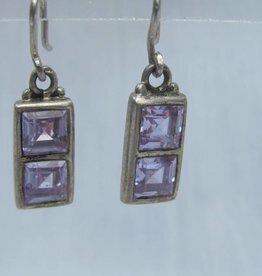 Silver earring with two square facet-cut amethysts that are cut by hand. Made in Jaipur India by a master silversmith with good working conditions. Measures: 1,5 x 0,8 cm (not counting the hook). 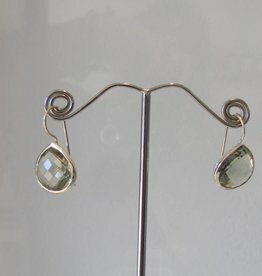 Silver earrings in dormeuse model with facet hand cut green amethysts. Length is 3cm, breadth is 2 cm excluding the dormeuse closing. 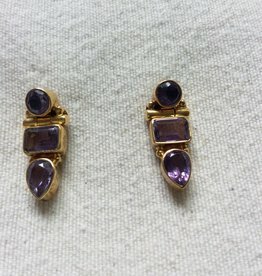 Silver and amethyst earring with a dormeuse closing. The amethyst is not covered with silver ion the back to optimalise the working of the stone and to make full use of light on the facets. Length 27 mm width 15mm including integral ear hook.